Warwick School Under-18s celebrate their NatWest Cup win. 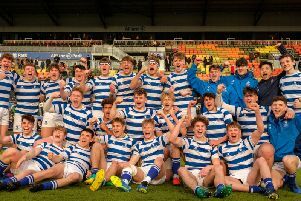 Warwick School final got their hands on the U18 NatWest Cup trophy a decade after their last title with an superb 27-5 victory over Bishop Wordsworth’s at Twickenham. While Bishop Wordsworth’s were finding their feet and getting used to the feel of playing in the home of English rugby, a Warwick side built around the 2013 Under-15 winners were blasting towards a 19-0 lead after just 22 minutes. Warwick School captain Nick Rigby. Within eight minutes they were across the whitewash through blindside Kieran Curran who powered over after a series of scrums near the Bishop Wordsworth’s line left the defending side short of numbers on the left-hand side. Six minutes later Warwick were back at it, sending a huge maul from near the ten-metre line to within inches of the try line. As momentum builders go, it was as good as it gets, and when the referee blew his whistle and ran underneath the posts for a penalty try, the large Warwick contingent erupted. An already charged atmosphere went into fever pitch. Will Tanner added the conversion for a 12-0 lead and eight minutes later he was called into action again as Kyriakos Grammatopoulos powered over from short range, in similar style to that of Curran. To really turn the screw, Tanner was at it again with the boot two minutes later, banging over a long-range penalty for a 22-0 lead. Interestingly, the penalty seemed to signal a change in tactics from Warwick who moved away from that early intensity and into a phase of trying to control proceedings through intelligent game management. By and large this tactic worked, though it did give Bishop Wordsworth’s a chance to finally enjoy some useful field positio. And, as the half drew to a close, left-winger Chris Nichols finished brilliantly in the corner after some heavy pressure from his side to narrow the gap to 22-5 at the half-time break. That same pattern continued after the interval and Bishop Wordsworth’s, to their great credit, really began to stop Warwick at source, forcing the 2007 champions to really grind out their opportunities. That they did, though, plugging away until eventually a hole opened up 18 minutes in and electric full-back Nick David took full advantage, scything through it on a great line to score his side’s fourth try of the game. That was to be the end of the scoring as Warwick, led by the unheralded Nick Rigby, closed out the game in the most professional of manners, while their incredibly boisterous supporters enjoyed what felt like a 15-minute victory parade.